always puts others before herself. Shawna Sousa will run the 2018 Boston Marathon for Mass General's Emergency Response Marathon Team in thanks for care her daughter and grandchild received. Shawna Sousa will run the 2018 Boston Marathon as a member of Massachusetts General Hospital’s Emergency Response Marathon Team, raising funds to support the hospital’s emergency care and disaster relief and preparedness efforts. It’s her way of thanking Mass General staffers for their care of her daughter, Cori Sousa, and her grandchild, Levi. Cori, 22, was admitted to Mass General eight times in 2017 as she struggled with complications from Crohn’s disease. She stayed at Mass General a ninth time last year for the birth of her son, Levi, who received treatment at the hospital’s Neonatology/Neonatal Intensive Care Unit (NICU). Mass General became a home away from home for Cori and Shawna, who was at her daughter’s side on every visit, working around her busy schedule as a program director for PLUS Co., a non-profit organization that provides services to people with developmental disabilities. At age 47, Shawna Sousa is training to run her first marathon — and a Boston Marathon, no less — to support programs at Mass General. The professionalism of doctors, nurses and staff members prompted Shawna to want to give back to Mass General. That sparked her quest to give Boston’s storied race a shot, even though she’s never before run anything longer than a half-marathon. Crohn’s disease inflames the digestive tract, leading to abdominal pain, severe diarrhea, fatigue, weight loss and malnutrition. Medicine controlled Cori’s symptoms until last year, when the pain became so severe that she repeatedly sought treatment at Mass General, traveling from her Brattleboro, Vermont, home to Shawna’s Amherst residence, so they could drive together to Boston. Shawna also credits Mass General doctors for always being ready to help Cori. During one of her recent illnesses, Cori’s regular doctor was unable for immediate consultation. Instead, Jeffrey Biller, MD, director of Pediatric Endoscopy at MassGeneral Hospital for Children, reached out to help. Dr. Biller was Cori’s doctor when she was a teenager, and she was warmed by the sound of his voice. There is no cure for Crohn’s disease, but these days Cori keeps symptoms at bay with new medication that is more effective than the one she previously used. 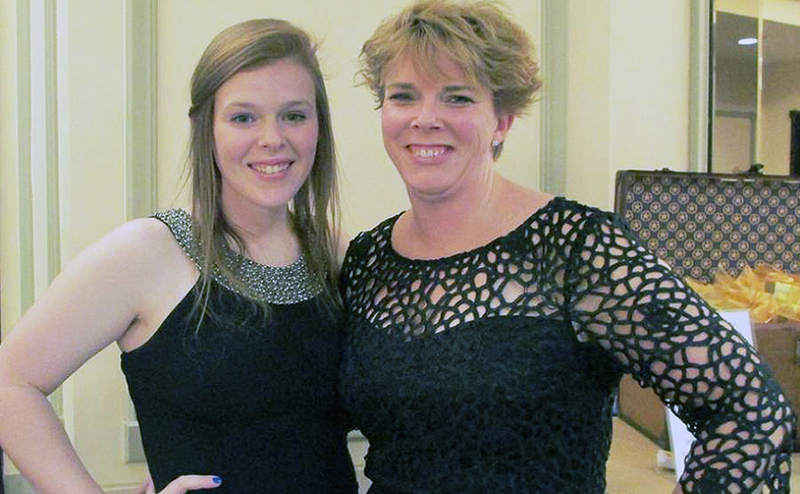 For her part, Cori marvels at how her mother always puts others before herself. Cori remembers how, when she had to stay overnight at Mass General to be treated for Crohn’s, Shawna would always be at her bedside when she fell asleep at night and when she woke in the morning. Please consider supporting Shawna and other runners raising money for Mass General’s emergency response efforts. John Hancock provides Mass General runners with bib numbers for the Boston Marathon. For 21 years, John Hancock’s partnership with the Mass General Marathon Program has been a powerful source of support for hospital programs. John Hancock provides Mass General runners with invitational entries for the race. Mass General’s Pediatric Oncology Team has raised more than $13.4 million since it was formed in 1998. Funds from this team’s runners support research and child life activities for children with cancer. In 2014, the Boston Athletic Association awarded Mass General additional entries to create the Emergency Response Team. Today, thanks to John Hancock, Mass General maintains 40 entries for runners on our Emergency Response Team. This effort honored the lifesaving response of hospital personnel following the 2013 Boston Marathon bombing. Since its launch, that team has raised more than $1.4 million for the hospital’s emergency preparedness and disaster training. In addition to these teams, runners who obtained their own entries for the Boston Marathon will run for the Run for MGH team, which raises funds for Mass General programs close to their hearts. Programs being represented by 2018 runners include The Cancer Center, Caring for a Cure, Cystic Fibrosis, Down Syndrome, The Lurie Center and the Mootha Lab. To learn more about the Mass General Boston Marathon Program, please visit our website. Help the Boston Marathon runners who support Mass General.